I have found that the majority of quilters love to sew with others and share their work. Although based on your location you might not have a guild that fits your style, a quilt shop with an open sew, or a community to reach out to. Welcome to the internet world where the ‘social’ aspect of quilting makes is easy to find your people! When I first started quilting years ago, I ‘instantly’ fell in love with Instagram. So quickly I was able to find quilters that liked the same fabrics, the same styles, and I could follow as many as I liked. Then I found online swaps and bees! First I joined a few swaps, thinking doing a one-off swap would be a good starting point. It was and it was nice. I was happy with what I received in return, even though it wasn’t *really* what I hoped for. Then in 2014 I joined an online quilting bee and here is where I found my true people! A group of quilters all working from the same book and sending each other blocks for a matter of 12 months. Instantly I had 11 new online quilting friends. We created a hashtag, picked blocks and color schemes, and had a wonderful time. I still follow many of those quilters today. But an online quilting bee might not always turn out with the luck I had on my first. There are a few risks in joining a quilting bee. 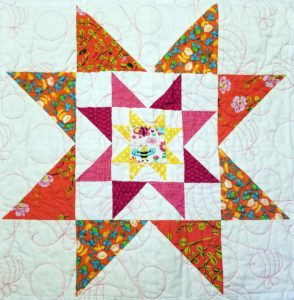 When you join a quilting bee there is probably a set of standards or guidelines set up. You might be working from a specific pattern or specific collection of fabric – which is what enticed you to join the bee. Then the fun begins with making and sending blocks until it’s your month’s turn. You chose a block and a group of colors for everyone to use and you eagerly check your mailbox that month, waiting for the blocks to arrive. Your blocks start coming in and it’s so exciting! But you take a closer look – is that block the right size? Is it square? Is it even the right fabrics? What if the quilter made it in the right colors, but didn’t use quilt shop quality fabric? Unfortunately these things happen. Honestly, you have no ability to control what people send you. Hopefully the blocks are the way you want, but they might not be. You have to decide how to use the blocks you receive. If it’s not a perfect block, can you square it to fit? Maybe you piece it into the back of the quilt or use it as the quilt label. Maybe you create the top as is and then donate the quilt to someone who will love it. Or donate a bunch of blocks to someone else’s UFO project. Ask yourself, will the person that sent you the block ever actually know if you don’t use it? What is important is to acknowledge and thank the quilter for sending their block even if it’s not perfect. This block could be more advanced to them and they did their best effort. They held to their commitment to make and send you a block, using their time and fabric to do so. If it’s not the quality you expected, take it with a grain of salt. 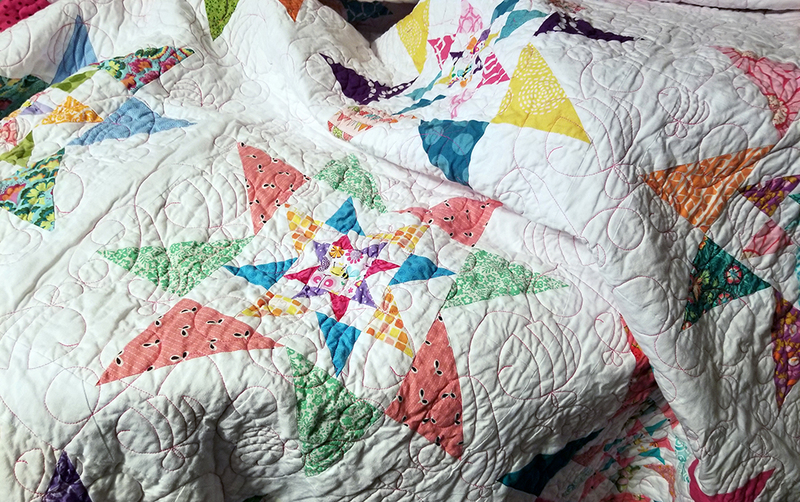 If you have been in a quilting bee before that didn’t go well, you may have a fear of being placed in a group of quilters that everyone starts off with tons of energy and excitement, but dwindles as it goes on. What if you choose a later month and people don’t want to participate anymore? What if you are in a group of 12 quilters, and you only receive 10 blocks? How are you going to make a quilt? These may seem like trivial questions, but they have been asked. We hope every group in a quilting bee gets along swimmingly and all exchange blocks for the duration of the project. Sometimes life happens, and you might not get all your blocks. For the quilter who didn’t send a block, you may not know what is happening in their life. The easy thing is to ask them! Ask if they are still working or need more time. Is the block more challenging than they thought it would be? Did they run out of that color fabric? We now know life happens, and it can happen hard. Are they located near any fires and need to leave for safety? Are they unexpectedly out of a job and need to count every penny, which includes postage? Obviously they don’t need to be that honest, but if you are in a group that is counting on you, we hope the quilter will at least respond and tell us “I’m sorry, I just can’t do this month.” You may jump to the worst conclusion, but give the quilter the benefit of the doubt and ask. If you get no response, well it looks like you just need to make yourself another block. Good thing you already did one for yourself and you know how! Maybe you are scared to join a quilting bee because you never have. What if they don’t like my skills? Will it be too time consuming? What if I don’t like it? But you know what, we bet you do like it. This can be awesome. You’re going to make a group of new quilty friends that all love the same thing you love. They joined the bee because they like the pattern, the book, or the fabric. They joined to make new friends. You might live in an area that doesn’t have a lot of quilt shops or classes, or guilds that are not in your style. Sometimes classes and guild meetings may be when you work and you just wish you had something you can be a part of on your own time. Here lies the perfection of online quilting bees. When you send out your first block, you might be a little nervous. But with each block you will gain confidence and a new friend. When the time comes for your month, you will see everyone’s gift coming in to you. Getting the mail will be exciting, not knowing whose block arrived. As soon as you have the full set you will be tempted to put them all together, even if it’s only a design wall for now. Whenever you do finish the project, you will always remember the group of quilters it came from. You will remember the blocks you sent, the challenges you may have had, and overall the fun of the bee. You might forget their names over time so if you’re smart, write them down now (speaking from experience – lol). But you won’t forget the feeling of receiving the blocks, the feeling of finishing a project made from a group of special quilters. Be it one month from the bee, or three years when you finally finish it, you will remember this quilt and its origins. This is what quilting bees are truly for. You found a new community of quilters, a group of friends, and a quilt that will forever have a special meaning to you. This quilt is from the first quilting bee I ever joined, and loved. Search the hashtag #moderninstabee2014 for great inspiration. Thank you-I am in my first bee and volunteered to be the bizy bee and coordinator of our international group. I have to say 3 months almost done and I and excited to creat a block to the next months Queen-learn a new technique and play with colors. I am hooked-or shall I say stung! Thanks for starting the #freespiritquiltingbee. I’m so glad your international bee is going well! Making new friends and learning new techniques is wonderful. Keep Buzzing!